This year has been a strong one for real estate investment trusts. 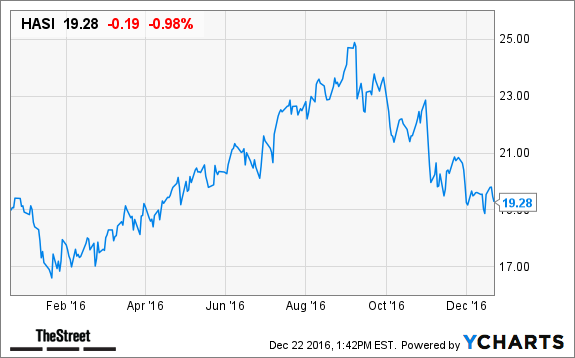 At the beginning of 2016, REITs came through when the rest of the market was in dire straights. Turmoil in Chinese markets and high oil prices, combined with a slew of other obstacles, made the stock market less attractive than it had been in years. At the time, financial uncertainty forced many to withdraw from aggressive investing habits and seek a safe haven in more stable commodities. Fortunately, the U.S. real estate market had been firing on all cylinders. REITs outpaced the S&P 500 for the better part of the year, even in the face of an impending interest rate increase. For the first 10 months of the year, the total return of the FTSE/NAREIT All REIT Index was 7.1%, while the S&P 500 posted a total return of 5.9%, according to REIT.com. And infrastructure REITs outperformed the rest of the sector during the same time period, with a return of a whopping 18.3%, according to REIT.com. Investors interested in tapping into that part of the REIT industry's trend might want to consider Hannon Armstrong Sustainable Infrastructure (HASI - Get Report) , which provides debt and equity financing to the energy efficiency and renewable-energy markets. The REIT posted third-quarter generally accepted accounting principle earnings of 7 cents a share, up 17% from a year earlier. On a core basis, earnings rose 12% to 29 cents a share. Meanwhile, the REIT closed $712 million worth of transactions this year, $117 million more than a year earlier. In addition, the REIT pays investors a quarterly dividend of 33 cents a share. The REIT's outlook looks promising. "Our core federal government efficiency market remains strong, with an additional $2 billion federal government target announced last month," Chairman, Chief Executive and President Jeffrey Eckel said in a statement. "We are also seeing increased activity in wind equity investment opportunities as well as commercial distributed solar." The REIT looks poised to maintain its position in the infrastructure sector because of its business from the government, and barriers to entry in this sector should keep competition to a minimum. These positives suggest that the REIT's recent growth isn't a fluke but rather indicative of sustainable trends.